How to integrate PayU with Jotform? Print Home / Payment Forms / How to integrate PayU with Jotform? PayU is an easy, secure and effective tool that provides getting paid online. PayU is a leading financial services provider in global growth markets. They use their expertise and heritage in cross border and local payments to extend the services. They offer these services to merchants and consumers. Their innovative technology, developed in-house as well as through investments and strategic partnerships, empowers billions of people and millions of merchants to buy and sell online, extending the reach of financial services. What can you do with JotForm's PayU Integration? How to integrate your forms with PayU? Log into your JotForm account and open Form Builder. After that, please follow the instruction below about how to integrate your forms with PayU. 2- Click “Add Form Element”. 4- Select “PayU” in the Payments list. You can drag&drop it into the form, too. 5- Integration wizard will be opened automatically as you see in the video above. On the integration wizard, fill the textboxes with your PayU credentials. Note: We have implemented PayU Money, too. You accept INR now. After you add PayU to your form, you will see a selection dropdown in the coming wizard. Existing PayU integration is also in use. You can select different currencies and payment types according to your needs. 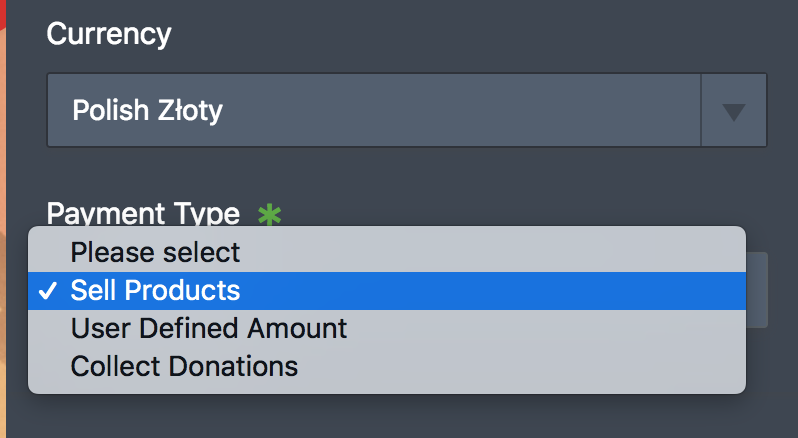 Use "Currency" and "Payment Type" dropdown menus. 6- You can click on Additional Gateway Settings to customize the integration even better. One of the most important functionality of Additional Gateway Settings is testing mode configuration. You can select SandBox Mode and test your gateway. It does not charge real cards. Please check PayU Poland Test Credentials page for more information. Jotform use redirect version of PayU (Both Poland and Money). This means that you supply all sensitive information in PayU pages. You can also use below test credit cards while testing. For any of the cards below you can use 01/2020 as expiry date and 123 as CVV. You can check PayU Money Testing page if you want to PayU Money. Below is the test card details for doing a test transaction in the testing mode. 7- If you select Payment Type as 'Sell Products', you will continue with click on “Continue”. If you select 'User Defined Amount' or 'Donation', integration will finish in this step. 8- In the next step of Sell Products, you will see the Payment Settings. You can create Products, Coupons, Shipping and Tax amount/rate according to your needs. You can add products etc to your form here. Do you have any questions or suggestions about JotForm’s PayU integration? Please post them in the comments below. How to integrate Worldpay US with JotForm? How to integrate Chase Wepay with JotForm? How to integrate FirstData (US) with your form? How to integrate 2Checkout with your form? How to integrate BlueSnap with your form? How to integrate eCheck.Net with your form? How to integrate PagSeguro with your form? Which fees do we pay to JotForm and WePay? Can customers safely submit credit card information?